removed before it enters the sewer system. Grease Traps may be placed under the sink or they may be buried. 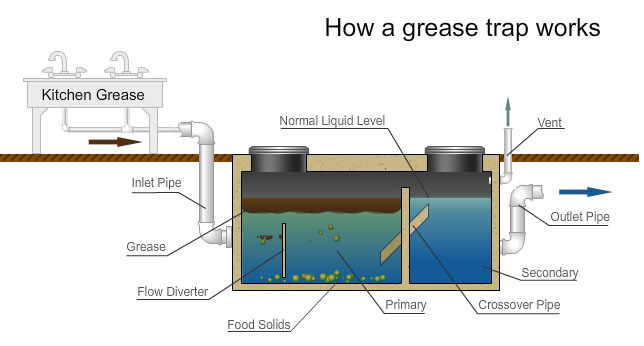 The size of a grease trap required depends upon the amount of waste that is produced by a given facility. Grease traps are differentiated by their pounds and gallons per minute. In order to function properly grease traps must be pumped and cleaned on a regularly scheduled basis. A grease trap protects your sewer and saves you money. Fat, oil and grease hardens as it cools and sticks to the inner lining of sewer pipes, eventually causing a blockage. When it comes to your plumbing needs, Harry Caswell Plumbing, Mechanical and Utility Contractor is ready to respond.